Aaron, author of “Autobiography Of A Naked Yogi” and teacher for the Yoga Teacher Training Immersions at Blue Osa, has been a student of yoga since 1991 and a teacher since 1997. He has traveled across the world visiting numerous yoga ashrams and retreat centers, studying with such respected yoga teachers as Alan Finger, Bryan Kest, Genny Kapuler, Rod Stryker, Swami Rama, David Swenson, as well as with numerous spiritual masters in the Himalaya Mountains. It was during a retreat in Hawaii that Aaron and his longtime student, Adam, first discussed creating “a community that is yoga-based… and where people can heal their spirits.” Aaron wondered: “Can we create a sanctuary where people can come, connect to themselves, reconnect to each other, and then reintegrate through yoga back into their life?” Six years later, they purchased property in Costa Rica. “Our vision with Blue Osa is that when people are quiet, removed from distractions of everyday life, something magical happens. A deep calling starts to surface, to awaken.” As Osa’s yoga director and Master Teacher, he believes there are several conditions that human beings need to have in order to find their right paths: “I really want them to be spiritually heated-up. When we get heated we can burn away our ego and our ignorance, which is what stops us from remembering who we are. Second, I want my students to leave feeling good and restored, this comes from a deep remembrance of who they are. Most important—is that they leave feeling a sense of community and fellowship.” Aaron feels blessed to be a witness to such transformations at Blue Osa. One of the original owners of the property, along with her late husband Jean-François, Marie was so inspired by Aaron and Adam’s vision for a Blue Osa, she remains the ‘mother’ of the Blue Osa family several years later. Born in Algeria and raised in the beach town of Biarritz in the south of France by a French mother and Italian father, Marie is a self-taught chef. She honed her culinary skills when her husband operated a stylish French bistro in San Francisco, and later an elegant French restaurant in Cartagena, Colombia. Mindful of guests’ health and dietary needs, Marie’s dishes are vegetarian-oriented and crafted from what local vegetables are available from Blue Osa’s organic garden and the local farmers. Meals are served family-style and often include a protein – fish, beef or poultry. Click here to read more about the food. Marie’s favorite cuisines are French and Mexican with her favorite dishes being Coq au Vin and Sopa de Pescado. Read more about Marie’s latest cookbook! Olger has become a connoisseur in the kitchen and brings smiles to many of our guest’s faces. He is always mixing and blending, chopping and dicing, grilling and baking, boiling and broiling! 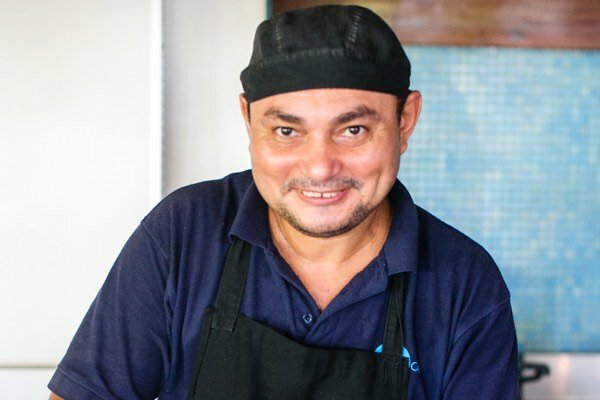 He prepares all kinds of delicious traditional foods including desserts like tres leche (“three milks cake”), side dishes like gallo pinto (rice and beans, literally “spotted rooster”) and main dishes of fish and meat such as pescado al ajillo (fish in garlic sauce) and carne asada (grilled beef). He brings a Costa Rican flavor and fusion to Marie’s European style – yum! Jose has been at Blue Osa since the very first day of construction. His hands were among those that shaped, sanded, and painted the massive wooden beams of teca that frame our yoga and kitchen structures. Today you’ll find him moving through the gardens of Blue Osa tending to the plants and keeping everything looking beautiful, and always smiling! A native of the Osa Peninsula, Jose has witnessed many changes in his lifetime; “Roads have improved, there are more tourists and more jobs.” He is optimistic about his future and that of his community and his family. 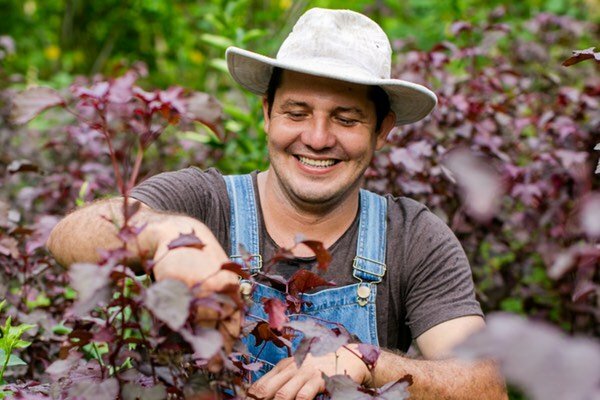 Jose’s primary job is to keep up the production of produce from our garden to the kitchen. Learn more about Jose’s Blue Osa Journey to Paris: Part 1 and Part 2. Sandro’s passion for massage therapy stems from his desire to help others come to healing and rehabilitation. Sandro’s degrees come from the Lafayette School and the Atsukai School, both in Porto Alegre, Brazil, and he honed his Japanese and Chinese techniques in Rio de Janeiro. 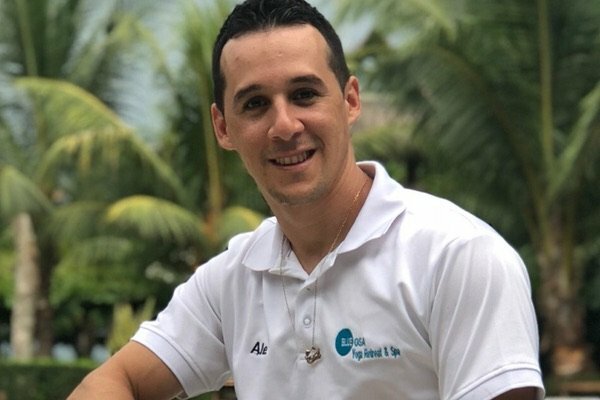 In his 15 years of experience, Sandro has travelled extensively, working in many countries such as Brazil, Finland, Spain, Argentina, Mexico, Panama, and currently for Blue Osa in Costa Rica. Sandro fell in love with the Osa Peninsula and its people when on vacation several years ago. The main draws for him are the Costa Rican culture, the tropical climate, and the direct connection with nature that is part of everyday life here. His favorite things to do when he isn’t busy guiding others to tranquility with his magical hands include exploring the jungle, surfing, playing music and running on the beach. When asked what Sandro has planned for the future, he responded, “In this moment, I love my life and the work I do. My plan is to stay put!” Now that’s Pura Vida! Originally from Argentina, Alma began working in connection with the body and it’s healing from very early in life. Her interest in alternative therapies started thanks to her mother, a Cranio-Sacral and Chi Nei Tsang therapist. Alma’s passion is to heal people, and she specializes in Reiki, relaxing massages and other techniques to help people achieve a better quality of life on a physical, emotional, mental and spiritual level. She is also known for her facials, body scrubs and wraps. Her treatments offer a gentle therapeutic touch that will leave you feeling nurtured and restored. When she is not relaxing guests in the spa she enjoys practicing yoga, running on the beach and spending time with her partner. After earning her Physical Therapy degree from the University of Santa Paula in 2005, Marcela came to the Osa Peninsula. “At first, I thought it would be for a year maybe” but, experiencing the energy from the rainforest, the pristine beaches, the amazing wildlife, and the people of Osa, made her decision to stay easy. With a philosophy of working for the people as a whole, body- mind-spirit, Marcela applies a holistic approach to her Spa Services. She weaves sounds, colors, fragrances, and natural ointments while employing the healing power of human touch to rejuvenate. Transformative describes the sense of well-being experienced in a therapy session with Marcela, whose small frame belies the strength of her hands, heart, and soul. Read about Marcela’s Thai Massage offerings here. Meet the feline inhabitants of the Blue Osa family. Mirabelle, Mike, Max and Suhka. They are our valued companions and we considered them an essential part of this community. Their presences brings a particular feeling of tranquility and hominess. In the sense that animals create an atmosphere of acceptance. comfort and love for many families and individuals. Our companions enjoy the attention guest lavish on them. At the same time they are well behaved and very well mannered. It is not uncommon for a guest to fall in love with one of our furry feline friends. Our canine resident mascots are Pete, Rama and Fiona. They are a vital part of our harmonious environment. Their fun-loving spirit contributes to the feel, the vitality, the energy and the experience of what is Blue Osa. You will find them eager and willing hosts, happy to greet you when you arrive, Pete, Rama and Fiona enjoy the ocean waves and will keep you company as you stroll our beautiful beach. After frequent romps on the hot sunny beach you are most likely to find an exhausted Pete, Rama and Fiona stretched languorously lounging beneath the cooling shade of an Osa Peninsula palm tree. Click here to read more about the Family Of Blue Osa!